Do they like the big leaves? Still, I wasn’t too creeped out. The leaves of this tree are enormous; I figured they could handle supporting these newly emerged creatures until they were ready to fly higher and begin their eerie thrumming calls. They’re not eating the flowers or the leaves, but they are marring the regal beauty of the flowers. For comparison, I looked at another nearby deciduous magnolia — Bigleaf Magnolia (Magnolia macrophylla) growing about 60 feet from the Ashe Magnolia. My Bigleaf Magnolia didn’t bloom this year, but its leaves are even larger than those of the Ashe Magnolia. 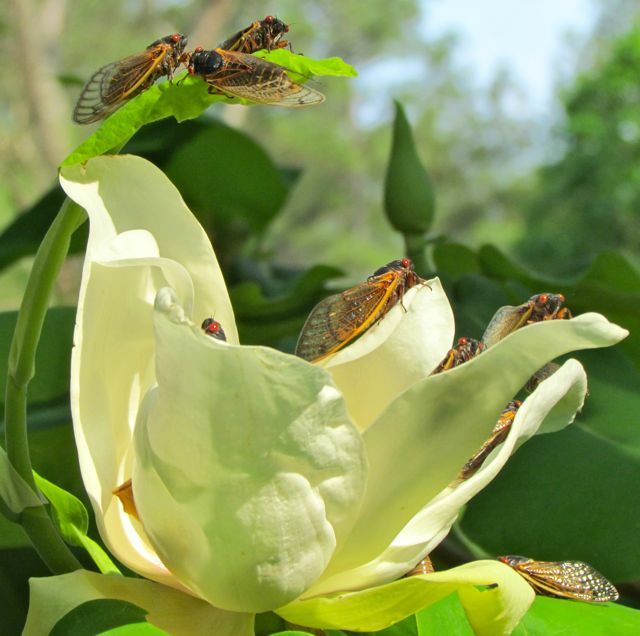 Can it be that the sweet perfume of these flowers is attracting all these red-eyed monsters? 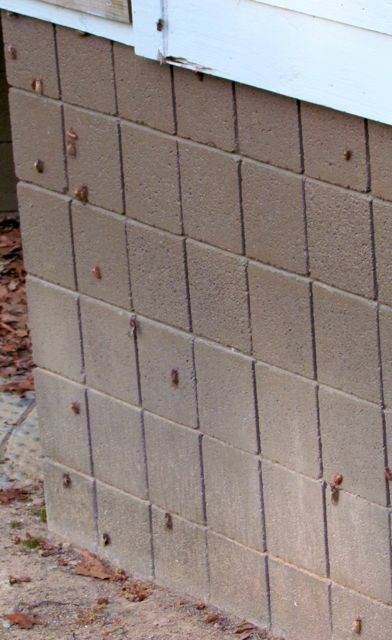 I have no idea, but I do know it creeped me out to see my lovely tree overtaken by these invaders. And now that I have grossed you out, let me tell you briefly why I love this native Magnolia. 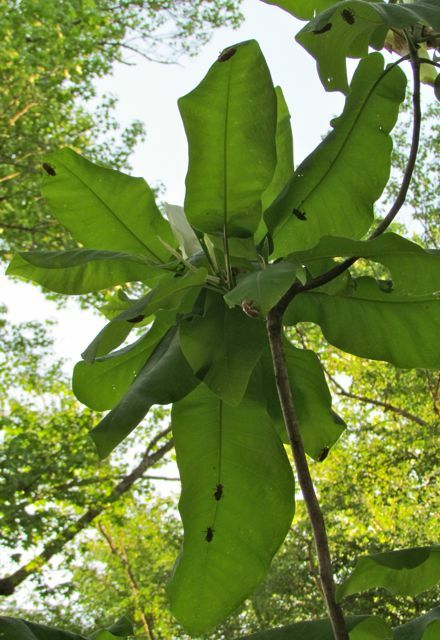 Many botanists consider Ashe Magnolia to be a subspecies of Bigleaf Magnolia; instead of calling it Magnolia ashei, they call it M. macrophylla, var. ashei. I imagine only a DNA analysis of the two will settle the debate, and I don’t really care. 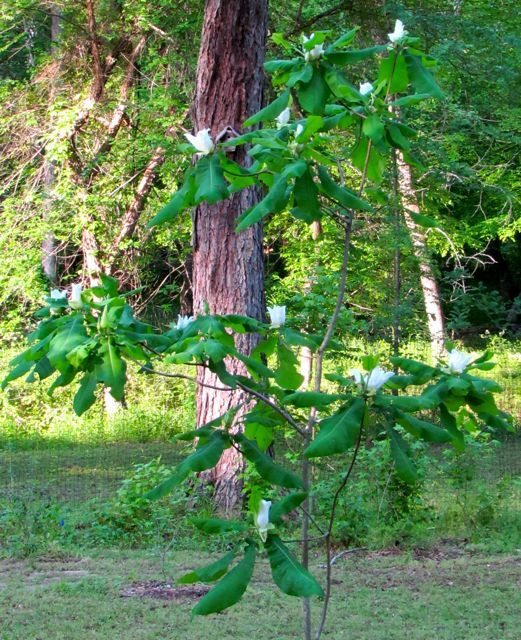 I can tell you that Ashe Magnolia’s leaves and flowers do very much resemble those of Bigleaf Magnolia. 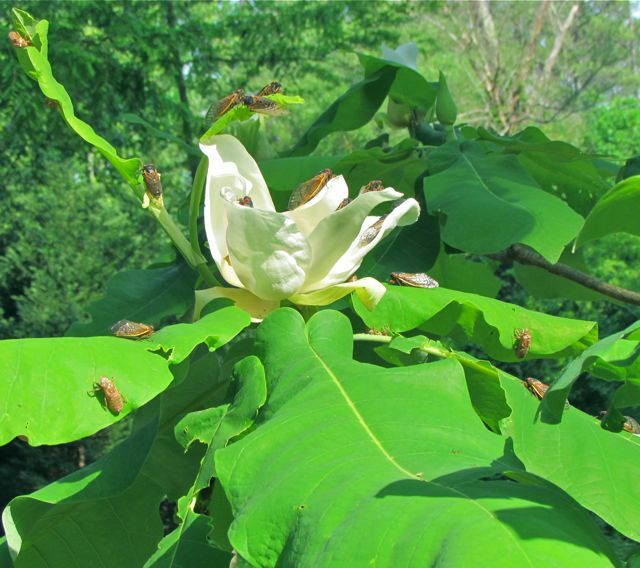 However, Bigleaf Magnolias can grow to great heights, and they tend to be unenthusiastic about blooming until they are quite tall. Ashe Magnolia, on the other hand, blooms when it is small; mine first bloomed when it was only four feet high. Its growth habit is usually described as shrubby, and it does produce a number of side branches that make it resemble a shrub, sort of. It is supposed to top out at about 20 feet, but I have a feeling mine may grow higher than that. Now that mine is 15 feet tall, it is blooming spectacularly. Instead of single flowers, many branches sport two-bud or three-bud flower clusters. 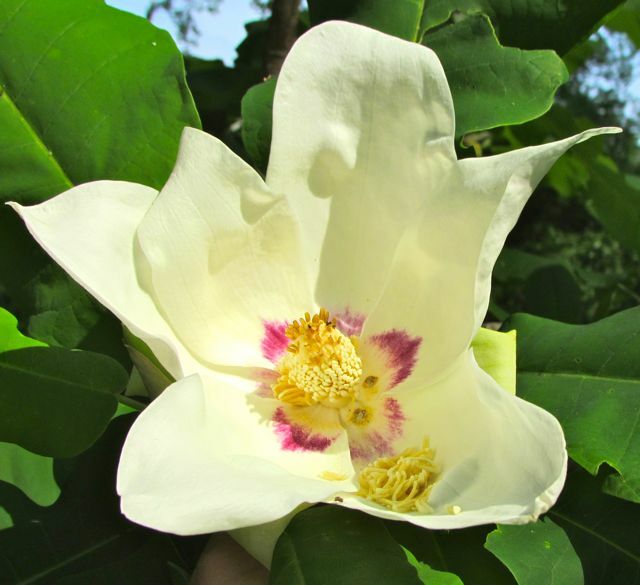 It’s a Magnolia flower bonanza, and each flower is at least six inches across, usually more! I would be remiss if I didn’t attempt to describe the fragrance. It is sweet, but not as cloying as M. grandiflora. I much prefer the scent of Ashe Magnolia. Its flowers are not as many-petaled as M. grandiflora, but it is still unmistakably a classic Magnolia family flower. This entry was posted on May 3, 2011, 9:33 am and is filed under Favorite Plants, Native Wildlife, piedmont gardening. You can follow any responses to this entry through RSS 2.0. You can leave a response, or trackback from your own site.